At 6 week old, she has established a routine which is very close to the family’s. I thank God for this. She wakes up in the morning, and entertains herself (I’d seen her kicking her legs quietly in the mornings). When she hears us waking up, i.e. the talking, the foodsteps in the house, she’ll call/cry out to us, to be acknowledged/carried or nursed. She spends the day in between sleeping and waking. When she’s hungry, she will call out instead of crying. Normally when Zara and myself nap, she’ll also be napping with us or quietly kicking her legs or punching her fists keeping herself occupied. From 6pm to 10pm, she becomes more demanding and wants body contact; she wants to be carried, or to be on the breast. This is when she cries the most, especially when we put her down. Dinner time is a bit challenging for us with Zara and Zaria both requiring attention at the same time. When it’s bed time, she takes light out as a que. After nursing her, and given Zara her milk, lights will be turned off. She’ll quietly lie on the bed, dozing off to sleep. She gets up once in the night, and another early in the morning to feed. Actually, she doesn’t cry out to be nursed, she just shuffles on the bed; being a light sleeper, I’ll wake up and feed her. (I’m thinking of ignoring the shuffling once she goes pass this week, since Zara stopped waking up to be nursed at 6th week). It has been rather challenging caring for Zara since Zaria’s arrival. She will have stomach aches when I’m nursing Zaria. She gets into accidents a lot like knocking her head on the dining table while walking, falling down from the sofa, tripping on things etc. She says things like, “I smack meimei yeah because she’s so naughty.” (when Zaria cries). She cries a lot and the trigger can be something very minute (e.g. Can’t pull out a book from the shelf; I need to be in the study blogging working; she wakes up and I’m not next to her). In the night, she will stay up until I’d finished nursing Zaria, and wants me to cuddle her to sleep. We started toilet training her (should have done this before Zaria came). Since last week, she’d only poo-ed in the toilet bowl, and sometimes if she remembers to tell us, she pees in the toilet bowl too. She wants me to be the one who help her with using the toilet and normally have urges to pee and to poo when I’m cuddling Zaria. She wants to be carried a lot, especially by me. She wants me to be the one bathing her, napping with her, brushing her teeth, helping her with the toilet. I don’t know how some SAHM does it, handling 2 kids without a maid. I salute them! I’m finding it tough even with a maid. I get so stressed when Zaria needs her feed and Zara gets all worked up and wants my attention too. I’m cracking my head with child care options after my maternity. Tuyam confirms she’ll stop working for us in early 2008. Hiring a maid seems to be a good option since the kids now need most attention. By 2008, Zaria will be 1 and Zara 3, and hopefully things will get better, and we will just need 1 maid (the new one) to handle the kids during working hours and to do the house work. Parents out there, do you have any suggestions for child care? I’m not as lucky as others, as my MIL is not keen too old to help. Zara getting ready to ‘nurse’ her lamb (something she does very often when I’m nursing Zaria); Zara and her cow boy costume; Zara wanting to look like the Chinese Four Princess tying her hair like that. Zaria, 2026 bond girl, started practicing for her audition. Actually it was over for me on Friday, when Daddy and I left the girls with the CL and Tuyam and went for dinner. Just the two of us. The first time we did this in 26months! Yes, since Zara was born, we never gone out for a dinner without her. Sad eh? When we got back, Zara was asleep. Tuyam told us Zara was hugging my bolster and pillow crying, “Mummy sorry, mummy, sayang (Malay : stroke, love) you (me)”; and she cried so long that she tired herself and dozed off. She thought I went out because I was angry with her, even though I’d told her we’d gone out for dinner with my boss and children are not supposed to go (a lie, I know) . I felt so sorry. Daddy sent the CL off with RM20 ang pow and full pay on Saturday. When Daddy told her about not giving her a big ang pow, the CL said she understood and she was sorry about the kitchen top. To be fair to the CL, although she was not very helpful with other chores ourside of her ‘job description’ (if they have one) and being so forgetful and careless, she was good to Zaria. That was why we kept her for the full 30days. No matter how many times I woke her up in the night to change Zaria’s diaper (if I knew it was soiled), she woke up willingly, never once sounded impatient and talked to Zaria softly while changing her. She called Zaria by her name and always spoke to her gently (my first CL told me she never called the babies under her care by their names, preferring to call them ah-boy or ah-girl). Before she left, she kissed Zaria on the cheek (Ew!) and told her to be good. Zaria had her fullmoon celebration in Dragon I on Saturday, just a family event. She was very well behaved with so many people taking turns to carry her. On Sunday, it was Daddy and my first trip bringing the two girls out. We just went out in the evening to the Lake Gardens, and then for dinner. To get everybody ready, it took 2hrs! Zaria slept througout the time we were in Lake Gardens and by dinner time she was awake and fussing. Dinner was total chaos. We have Zaria crying (which is getting more common after the CL left) in my arms; Zara on Daddy’s lap refusing to have her dinner and making a mess of everything on the table. Both of us were eating with one hand, while holding on to each girl with the other. It’s nice to see that Zaria is getting a bit chubby, and I feel proud knowing that all this was the result of her drinking the milk I produced. She latched on well since day one which makes breastfeeding her easy. She now drinks 3 to 4 hourly, and I think she should be drinking about 3oz. In the day, when she wants milk, she’ll just give us a shout (yeah, a shout, like “Ehhhh”); and in the night (she probably knows this since the room is dark), she only makes the “Eh Ugh” sound or shuffles in her sleep when it’s time for her feed. Once she ‘informs’ us she wants her milk, she patiently awaits for us to feed her. What a nice baby she is. She’s now nick named Chubby Cheeks at home. 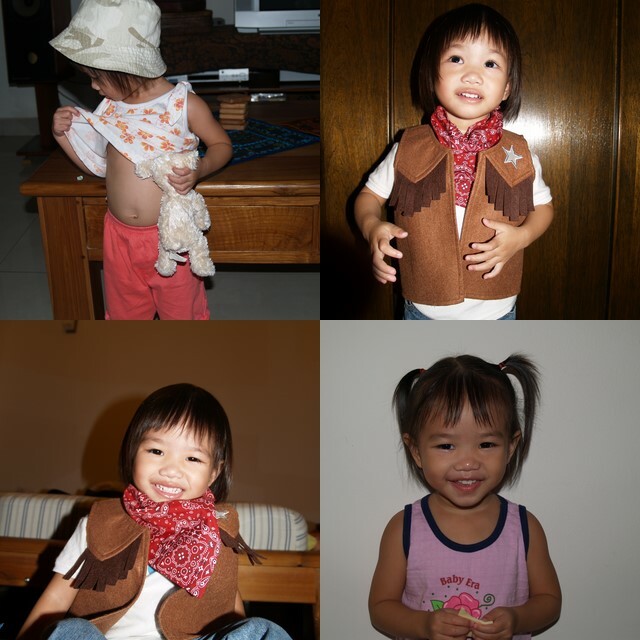 Since Zara only weaned off from the breast at 18 months, she remembers those breast feeding days. I initially thought I will probably need to do tandem feeding when Zaria was born, but she was proud to have been ‘promoted’ to jiejie, and she thinks only babies drink from breast. These are said so frequently at home these days; and Zara suddenly realises that mummy is not 100% hers and that she’s no longer the only one who gets all the attention in the house. Zara started to demand for more attention. She insisted that I nap with her, and if I didn’t, she would cry. When she wakes up from her nap and doesn’t see me next to her, she will wail, and shout for me. At night, she wants to sleep with me on my bed, and wants me to have my arms around her when she goes to sleep. I have to lie down in such a manner that I can have my arm holding her and at the same time feed Zaria. Daddy and I have to really try and split our time among the 2. Zara now is more vocal and demanding, and since Zaria is more easy going, she’ll just lie there waiting to be fed. We have to be careful not to give in to Zara’s demand too much that we’ll deprive Zaria of our attention. Sigh. Parenting with 1 child is tough, with 2, sometimes I feel like tearing my hair out (and this is just the beginning)! I pray for patience every night, and that I be fair to both kids, not to the one who shouts the loudest. 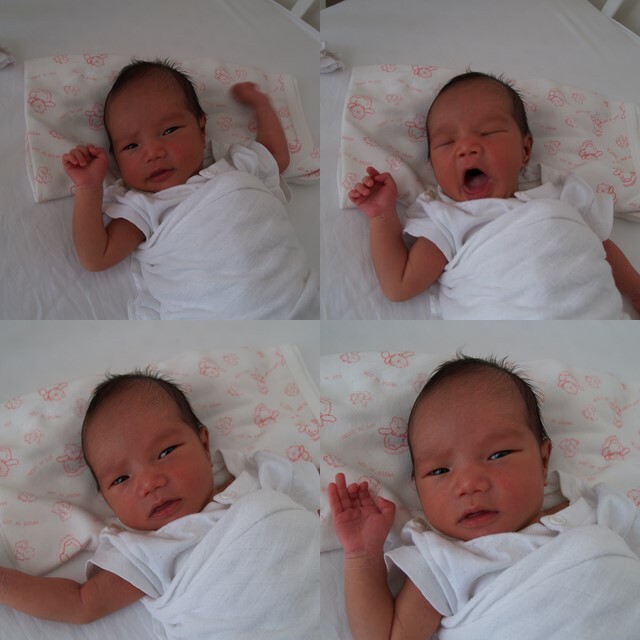 Zaria has entered into week 2, and as a new born we can see that she’s very much different from Zara. Zara wailed for her milk when she was younger. And if we were a bit slow, she wailed until she turned all black. Zaria just shuffles about, making ‘ek, ek, ek’ sound, when she wants milk. And patiently waits for us to feed her. Zara dislikes wet or soil diaper even when she was an infant. When she cried, we have to go through a check list : 1) fed? 2) burped? 3) diaper wet/soiled? Zaria is just not bothered with her diaper, if it’s on, if it’s wet or if it’s soiled. We think she’ll have more patient than Zara, and probably better temprament. Maybe it’s just the ‘any thing also ok’ attitute of a Capricorn. We shall see. She’s also very direct nowdays. If we talked too loud when she’s watching her TV program, she’ll say “Shh.. Don’t talk so loud.” If she saw the CL siting there watching her TV program with her, she’ll say, “Aunty, close your eyes, don’t watch. This is Zara’s show.” Since she’s not very fond of the CL. She’s very good with Zaria though. She is very gentle around her. “Mei mei very fragile, Zara must be careful, yeah.” she reminds herself every time she’s near Zaria. She likes to stroke and sniff Zaria’s hair, her way of showing her affection to Zaria. Zara’s pretty loving towards meimei the minute they met. She wants to ‘sayang’ meimei every time when meimei cries or frets by stroking and singing to meimei. She likes to hug meimei for no reason. Drinking milk together in the night. Meimei’s small hands compared to mine. Zara has also started to ask the Why question. E.g. “Why the korkor (Chinese : big brother) nose like that one” when she saw a picture of a boy with big longish nose. Zara’s is getting better in reasoning. And she started calling Daddy “Dad” and me “Mum”. I have no idea where she learn that (TV maybe?). Our 2nd daugther was born on 28th Dec evening. I opted for elective induction and admitted in the morning to be induced. Dr inserted a pill into the cervix to start things off and later put me on drips. I only got a little contraction, I could still read, listen to music, talk to Daddy gaily. When the drip dosage was increased to 100%, my cervix was barely 2 cm opened, even though the contraction pain started to become unberable. I wanted to go without pain relief for as long as I can but after 1 1/2hr, I started using the (entonox) gas. Then the midwife suggested that I go with pain killer since I got very tense every time the contraction started which would affect the cervix dilation. After talking to Daddy, I opted for Pethidine, just like I did with Zara’s birth. 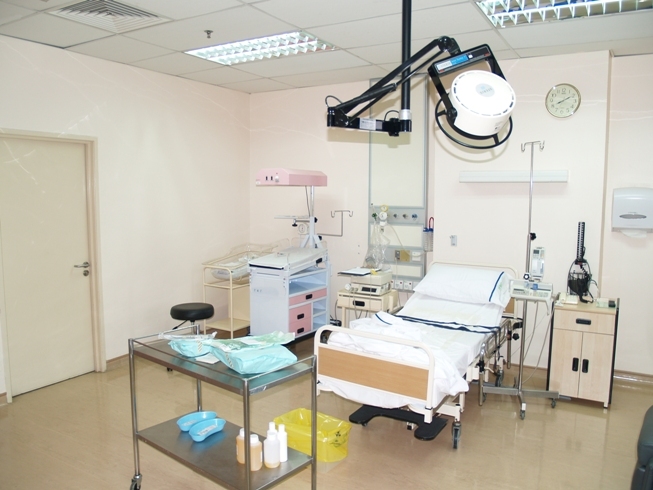 The minute Pethidine was injected, I started relaxing and the cervix started to dilate. We were disturbed by baby’s heart beat though. Every time when a contraction started, her heart beat went down, after the contraction, the heart beat recovered. Dr was called and he told us that it may be due to 1) baby was compressed in the birth canal or 2) baby’s umblical cord was around her neck. The latter could be life threatening. He told us we could either opt for emergency c-sect for safest bet, but looking from the way things are progressing, he told us to hang a little bit longer. We were worried, but trusted his judgement. Soon after that, I could feel the urge to push (that’s why I didn’t want to go for epidural since it will numb all such sensation). Midwife checked me and found that baby’s head was already crowning. Every thing started to happen, within minutes, Dr was back in the labour room, gave me an episiotomy, and the delivery began. This round, no help needed, baby just got pushed out with one push. The minute I heard her cry, all pain was forgotten, although I still felt a bit high and dizzy from Pethidine, the rush of joy was overwhelming. 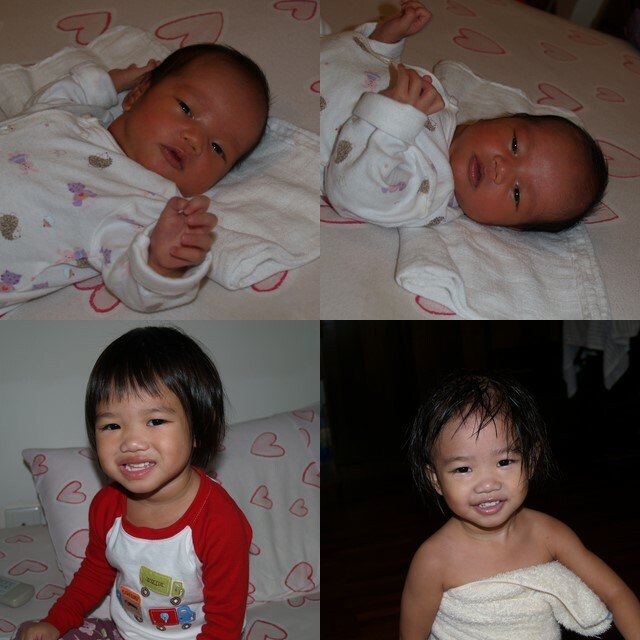 The little girl was 2.91Kg (Zara was 3.39Kg), and her height was 51.5cm (Zara was 50.5cm). I worried too much. 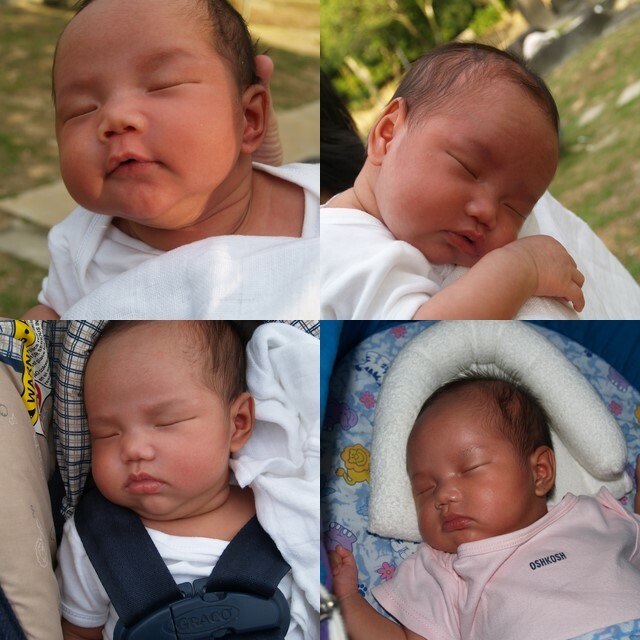 When I was pregnant, I was constantly worried that I will not love baby as much as I do with Zara. I just found new capicity to love her. How can you not love your own flesh and blood? Baby is good, she’s more patient than Zara and even when she’s hungry, she’ll cry a little and wait for me to feed her (Zara used to cry and turn black every time we were a bit too ‘slow’). She sleeps a lot still, but when she’s awake, she likes to look around, checking us out. 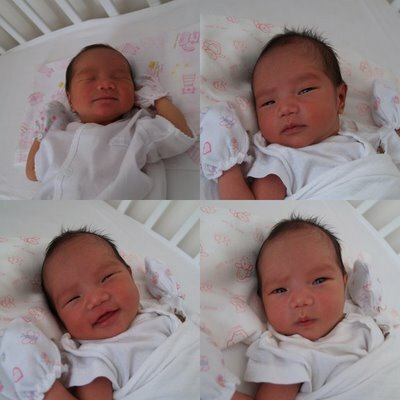 She was admitted back to the hospital for jaundice for 2 nights and now she’s back home coping well. 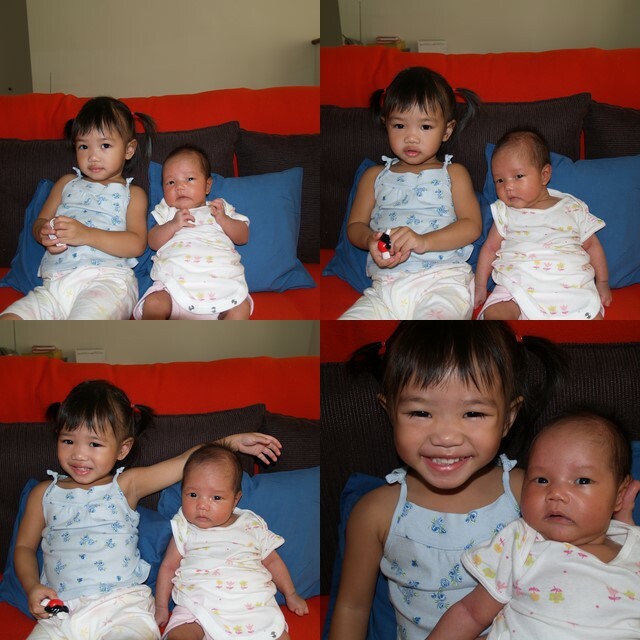 Zara is doing very well as a jie-jie (Chinese: Big sister). We gave her a set of nice markers as a present from baby and also bought her a baloon when she came visiting, telling her she’s now jie-jie to baby and mummy’s assistant. She’s very proud of her new titles. The first few days, she cried when baby cried for milk. She didn’t want the Confinement Lady (CL) to handle mei-mei when mei-mei cried but insisted that “Mummy, sayang (Malay : pat) mei-mei. Don’t want aunty (CL) sayang.” She constantly wants to hug and stroke her mei-mei but unfortunately, she contracted chicken pox (probably from visiting mei-mei in the peadiatric ward) after mei-mei was discharged and we told her not to be too close to mei-mei for the time being. What’s wrong with these people? They think so highly of themselves that they don’t wash dishes, do house work or help out with the older kids even when they are just siting around doing nothing. I’m barely able to stand her, and Daddy is very tempted to get rid of her. She’s more like a cook instead of a CL. Since I’m 100% breastfeeding, and I like to be a bit hands on (like cleaning baby’s poo or topping and tailing baby) she doesn’t have much to do. Baby sleeps with me in the night, and when I naps. I wake up to feed her while the CL sleeps away. She cooks for me 3 meals a day, washes baby’s clothes, bathes baby and that’s about all she does. She doesn’t help with Zara at all, nor anything else in the house. She sleeps when I sleeps (and sometimes before), and when Zara watches her VCDs/DVDs, she watches with Zara(but not to care for Zara, even small little things like giving Zara snacks or taking a drink for Zara from the fridge, CL will shout for Tuyam to do it). The only good thing that came out of this is she knows what I should and should not eat and make sure whatever I take help with milk production. With Zara (without a CL), my milk came on day 5. With baby, my milk came on day 4 and supply is pretty good. I’m doing fine but a bit tired. 2 kids vs 1 is very different. When baby is feeding and Zara needs attention, I have to be tactful, or still give Zara the attention by talking to her or doing things with her with my free hand. I still try to spend as much time as I can with Zara so that she doesn’t feel I’m neglecting her. When baby is alert, I try to talk to her and carry her around to show her the house or look at new things. I only get to rest when both of them are sleeping. Luckily, I can breastfeed while lying down, so in the night when baby wakes up for her feed, I just latch her on and continue to sleep while she feeds. I’m not sure what is wrong with blogger but have been trying to post more photos but not able to after the hospital shot.. *sigh* May not be able to update or read blogs as frequently for now until things are more settled.